Wow. It seems like it was just summer. But somehow today was the beginning of Advent. How did that happen? Time has flown over the past few months, even more quickly than usual. And yes, this is something I tend to complain about, so I will try to keep Pastor's admonition in mind. This week is going to be one of the fast ones. We have dentist appointments and a number of errands and tasks that need to be completed. So about Wednesday, when I am moving frantically through the week, I'll try to remember to be thankful that time is going fast. Once I start looking at Sitemeter, I tend to look at it off and on for a couple of days. Then I forget that it exists for weeks at a time. So I checked it out tonight. One of the visits to my blog came from a google search for "random things." That is just so appropriate. Bethany and I are at my mom's tonight, preparing for the family dinner tomorrow. We've done some chopping and slicing, getting ready to put together the stuffing tomorrow. We've snapped the green beans. We've checked a couple of times to be sure that we're all set to cook tomorrow. We had some delicious Pizza King Pizza, followed by a yummy brownie. And now we're sitting around watching the news. My mom is trying to distract me from my blogging, because I should be paying attention to her. My husband and the boys will be down after church tomorrow. And during the course the afternoon we will have another twenty people arrive. Cheryl tagged me to tell you seven weird, random things about me. Random is usually something I'm good at, so I'll give this a try. 2. I attended four colleges and had six different majors. I graduated with almost 150 credit hours. 3. All of my children have dark hair and brown eyes. All seven of my nieces and nephews (not step) have blond hair and light eyes. 6. Eating oranges makes me feel sick, except when I was pregnant. Then they helped my morning sickness. 7. I was a lesson junkie when I was a kid. I had lessons in tap, ballet, tumbling, piano, guitar, flute, voice, tennis, swimming, ceramics, bowling, breadmaking, trampoline, roller skating, and horseback riding. There may be more that I'm forgetting. I'll tag a few people, avoiding those already tagged. But if I don't tag you and you want to play, do it! Bethany, Mossback Meadow, Jan, Shawn, and Jonathan. with 1 small onion, chopped. 1 can of corn or 10-16 oz of frozen corn. Simmer for 15-20 minutes or more. a few cloves minced garlic (or 1 tsp dried garlic powder). Simmer 15-20 minutes or more. We top it with shredded cheddar, colby, jack, cojack, etc., sour cream, and fritos. I don't look at my Sitemeter often. I'm usually in too much of a hurry to care who is reading my blog, but once in a while I check it. Very few of my visitors come from searches, but those that do are almost all about food. Just today I had two people searching for Schultz Salty Stix, and one searching for Mr. Salty. One was searching for Cinnamon Clusters Cereal. So, has anyone found a replacement for Planters Cheez Balls? They were discontinued, but I have heard a rumor that Blockbuster is carrying them. I'll have to go check it out! We finished today with the government class that I taught this fall. I enjoyed it, for the most part. I liked the subject matter and the kids were great. The only real problem was that I am lazy, and putting a class together takes work. The enjoyment--and the benefit to my boys--outweighs the inconvenience to me sufficiently that I'll be doing at least one other class in the spring. I'm feeling pretty free until Christmas. I have lots of cookies to make, and I am hoping to make a few gifts, but there are no major commitments until after the first of the year. Is anyone besides me still thrown off by the time change? I've never had trouble getting back on track before, but I think that the fact that the time change was followed by election day--which is a huge disruption in my sleep patterns--followed by two bouts with bugs, has really gotten me off track. I usually wake up at 7:00 with no alarm clock. If I want to get up earlier or be sure I'll wake up I set it, but my wake up time has been very consistent for a long time. Since the time change it is 8:00 unless I set the alarm. (And this is really bizarre, because the time change went the other way.) I've been tired and draggy no matter how long I sleep. I've heard people complain about the time change time being hard for them and I've kind of pooh-poohed it, but I think I'm feeling it this time. Or maybe I'm just staying up too late. I have long recognized that I suffer from a tremendous case of FOMS*. It has led me to join groups, to go to events that I don't have time for, and stay on email lists that have lost any relevance to my life. It led me to Facebook, LibraryThing, The Wittenberg Trail, Classmates, and Good Reads. And now, because the curiosity was too great, I've joined Twitter. Twitter led to Twittermoms. This feels like a moose-a-muffin situation. But hey, if you Twitter, I'm there. I love LibraryThing. I especially love the Early Reviewer program because I get free books. The books I've gotten have ranged from this-is-a-waste-of-time to absolutely wonderful. My most recent book is toward the latter end of the spectrum. I began to read The Jumping-Off Place by book light in a camp bunk with barely a glance at the cover. There was a lovely old-fashioned quality to the writing and the characters that surprised me until I looked more closely the next day and realized that the book was written in 1929. This is a wonderful story, set in one of the last bits of the frontier after the turn of the twentieth century. Four orphans, having just lost their beloved uncle, travel to South Dakota to "prove up" his claim. They face hardships--drought, blizzard, wind, and an adversarial neighbor--with maturity, hard work, generosity, and an unquenchable spirit. In the process they fell in love with the prairie and the community and it with them. This is an excellent book for all ages. It would make a very nice family read aloud, particularly because there is some lovely prose. The original illustrations have been retained and enhance the historical feel of the book. The South Dakota State Historical Society has added an afterword with historical background and author information and a word list, adding to the educational value of the book. This 1930 Newbery Honor Book was a joy, and I am very glad that the SDSHS Press has decided to return it to print. Alan Keyes has filed a lawsuit. Philip Berg's Writ of Certiorari, filed in the U.S. Supreme Court is awaiting a response from Obama and the DNC, which is due by Dec. 1. If you can't read the entire thing, at least read Berg's Writ through the Table of Contents. Aside from the specific questions about Obama's citizenship, there are the larger questions: Who insures that candidates are eligible to run for president? Who has the right to challenge their qualifications and where? How much does our constitution matter? My theme for the past month, and for the foreseeable future is "bringing order out of chaos." And chaos isn't too strong a word. I have managed to function for the past couple of years by only doing what is urgent at any time, and letting everything else slide. I was trying to do too many things without the time, space, or tools to do them properly. I would scramble to clean the downstairs for company, and a chaotic mess would be shifted upstairs, but I was always in too much of a hurry to put those things in their proper places later. I've written about ironing my dish towels. It's a small thing, but it is bringing order, and I like it. Today is a closet-cleaning day. I'm getting rid of outdated records, straightening the linen closet, and getting rid of things that no longer serve a purpose. As I decide to keep something I am making sure that it has a place of its own. My scrapbooking weekend helped to bring more order, but it also pointed out how much I've lost track of things. I discovered when I started working on my books that I thought I had pictures from 2007, but they were from 2006. I couldn't figure out where the late 2007/early 2008 photos were. I finally figured out that they had been saved to my old computer and never uploaded to Snapfish. I have always printed my photos in order, but I'm really messed up now! This isn't a big problem, but it's a symptom of the disorganization that I've been living with. When my life is chaotic things slip through the cracks. I'm fortunate that most of them have been small! It seems like I'm always trying to grab on to the extra little pieces of time to do the things I want to do, but twice a year I set aside a whole weekend just to have fun. So I'm leaving tomorrow morning with two friends to go scrapbook for almost three days. I love the order that scrapbooking brings to my photos and my memories. I love the creative outlet. I've looked at digital scrapbooking options, but I love the feeling of the components and playing with the paper, moving things around to fit them on the page and tell the story. I love to write about the people and the places and the memories they bring. So I'll drink coffee, eat snacky food, talk, laugh, cry, and have a really good time. And I'll come home feeling like I've taken a few more steps out of chaos. After all of the serious political posts, I decided it was time for a frivolous post. I went shopping yesterday. I was on a mission. I have really trimmed down my wardrobe and I only shop now with a plan. If it doesn't fit the plan I don't buy it. Yesterday I was looking for a jacket to wear with my habitual black base of black top and black pants, skirt, or jeans. I have a couple, but they are dressier that what I was hoping to find and they are also several years old. I also was looking for a new print skirt to mix in with my black or white tops. I also found a brown jacket that fits the plan and was on clearance for 24.99. Since my birthday was a couple of days ago and I had good coupons, I decided to go for it. Really, what better blog award could an unschooler get? Thanks, Meg. 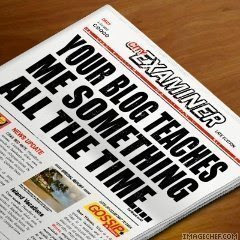 I always learn something from your blog, too. This award didn't come with specific instructions for passing it along, and there are so many of you that I learn things from, so I will just name a few. I know some of you aren't the award passing out type, and that's okay. And I'll leave some really good ones for those of you who are to name. Cyberstones, and not just because he's my pastor. Thinking-out-loud. Rebellious Pastor's Wife. Concordian Sisters of Perpetual Parturition. Bi-Coloured Python Rock Snake. Father Hollywood. It's almost hard for me to use the word change right now, but we have to remember that some changes are good. Juan Williams, who is also author of the book Enough, has a piece in the Wall Street Journal today that I would consider a hopeful look at how Obama's election may change racial politics in the United States. Part of his article is a reminder of how far we've really come in less than fifty years, and part of it is focused on where things can go from here. As in his book, Williams takes a matter of fact look at matters of race in America that recognizes the evil that is part of the past, but holds individuals and families responsible for their own futures. Sarah Palin is doing an interview with a national network, making pigs in a blanket, in a suit and heels, with a crockpot on the counter next to her. She's funny, at ease, and smart. Glenn Beck. He had his interview debut on the O'Reilly Factor tonight. His analysis of why the Republicans did so poorly in the election: "They stink on ice." Added note: The Wall Street Journal has a good piece today by William McGurn calling on McCain to stand up for his former running mate. "it's important that president elect Obama is prepared to really take power and begin to rule day one. Memo to the president-elect: You are not going to be king, Pope, or Grand Poobah. And be sure you check out www.change.gov. This is the website of the "Office of the President-elect." The title is descriptive of the content, which seems to be altering with each passing minute. One way for Obama to realize his peaceful transition to power seems likely to be the muzzling of his critics. Some birthdays are harder for a mother to believe than others. This is one of the hard ones. My baby is 13! Happy Birthday, Andrew! I don't think McCain would have been a good president. There. I said it. Would he have been preferable to Obama in some areas? Maybe. The main reason I supported him was the issue of life and the possible appointment of Supreme Court justices, but I never really had any confidence that he would have been less of a compromiser in that area than he has always been. He has never been a conservative. He has trampled on the First Amendment. And I'm glad he won't be president. Does that mean I'm happy with Obama? Of course not. I still think he's a socialist. There's already talking about appointing a global warming czar. (YAY! More government!) But I am going to wait and see what he does. Some of his supporters are going to be disappointed. I won't, because I'm not expecting anything good. Pastor Petersen has a good post about our new president-elect. I do think that having a black president is a good thing for our society. I know some of my friends don't see this. Maybe the "goodness" of this is more apparent to those of us who have grown up in integrated areas and have many individual black people about whom we care. It shouldn't matter, but the reality is that skin color has mattered very much in our history. I pray for his safety and that his administration helps to heal wounds. And I hope he is a good president. Over the past eight years we have heard liberals and members of the media hoping that George Bush would fail. We have heard them gloating about everything that has gone wrong. Let's not be like them. Let's not hope he screws up so "we" can take control in four years. Peace and prosperity are best for America no matter who the president is. I just watched President Bush's speech congratulating Senator Obama on his victory. He was gracious and I'm sure will help to smooth the transition. I would bet that Obama's team won't move into their offices and have to deal with vandalized computer keyboards, obscene voice messages, a chaos of switched phone and fax lines, and other juvenile acts of pique and disrespect. George W. Bush will leave the White House with dignity. Along that thought line, there was a piece in the Wall Street Journal titled today, The Treatment of Bush Has Been a Disgrace. I have been disappointed with President Bush, and frustrated by the inability of his administration to communicate effectively with the American people. But I have been far more frustrated with and disappointed in the American people who willingly and uncritically bought into the "Bush lied" lies and the media's inarguably biased reporting. I think history will see him differently, juat as it does Harry Truman. Evan posted Jonah Goldberg's thoughts on the election to his blog. They are well worth a read. Time to pray for our president-elect. As of 6:00 last night I had to put aside my very strong political opinions and put on my non-partisan Election Inspector hat. It always amazes me how easily I am able to do this. It amazes me that I can go have a great day in a polling place that voted 90% for Obama. It surprises me that I can happily instruct person after person, in answer to their questions, exactly how they vote straight Democrat. But I love it. I love the people at my precincts. I love being a part of the process. Now I'm home, having my post election gyro and a pumpkin ale. Yes, I am watching the election returns. But I refuse to be stressed. I've been humming--and slowly memorizing--one hymn for two weeks now. I've emailed it to my mom and a couple of non-Lutheran friends. You Lutherans may be able to predict what's coming, but here it is anyway. "Praise the Almighty, My Soul, Adore Him"
1. Praise the Almighty, my soul, adore Him! Yea, I will laud Him until death. As long as He doth give me breath. Bless, O my soul, His holy name. Earth-born they are and soon decay. When the dark grave doth claim its prey. Trust ye in Christ, our God and Lord. And who in hope to Christ draws nigh. Counsel and aid He doth afford. Of Him who doth such wondrous things! With happy heart its "Amen" sings! Translated by: Alfred Brauer, 1925, alt. Titled: "Lobe den Herren, o meine Seele"
Tune: "Lobe den Herren, o meine"
Of course, we all knew I couldn't let this week pass without one last political post. First my friend Jenny shares this. Sorry Obama fans, this is scary stuff. Combine this with Obama's long-standing antipathy to individual gun rights and it's no surprise that sales of guns and ammo are up. Then we have the usual libs threatening to leave the country if McCain wins. Please. Go already. Then there are those who predict violence if Obama loses. These are the folks who consider themselves so reasonable. Obama surrounds himself with such thoughtful people. Enough. I'm getting all agitated again. I waited in line for 2 1/2 hours to vote. I had to vote today since I will be working at a precinct other than my own on election day. Next election I'll go back to an absentee ballot.